I don’t usually do tension squares. I figure add about 15-20% more stitches for lots of stranded colours and 10-15 % for heavy cabling. You can often look at the pictures of the cabling patterns and tell what is being drawn in. I had no idea on this stitch, Triangular Stitch or Mock Kilting, pg 28. Barbara just said it had a tendency to roll up into false pleats. 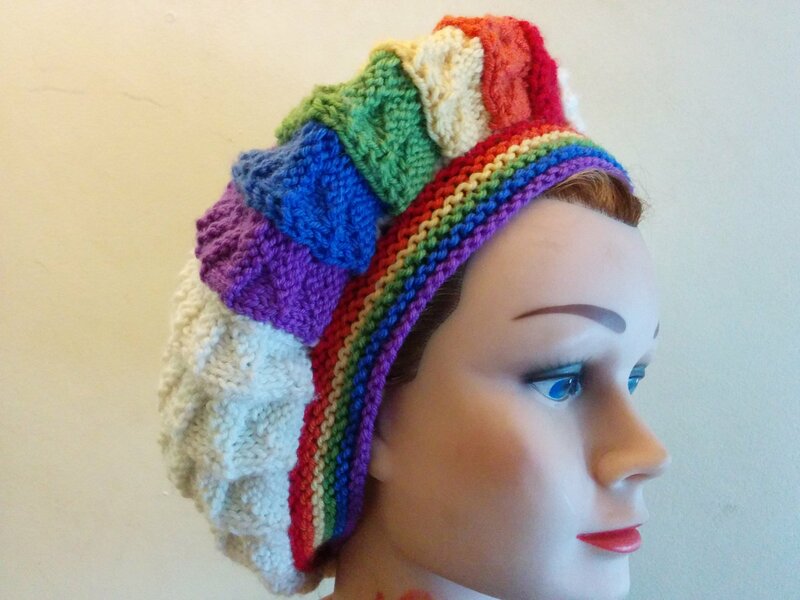 This sounded like it would work for a tam type hat. I made a tension square on 49 stitches and did about 4 inches so I could get a good sense of how much take in the pleating caused. I then measured over the middle 35 stitches to determine that 35 stitches drew into about 4 inches. I multiplied this by 5 to get to the ballpark of 20″ (the nice thing about knitted hats is that they will stretch a bit). I cast on 175 stitches. 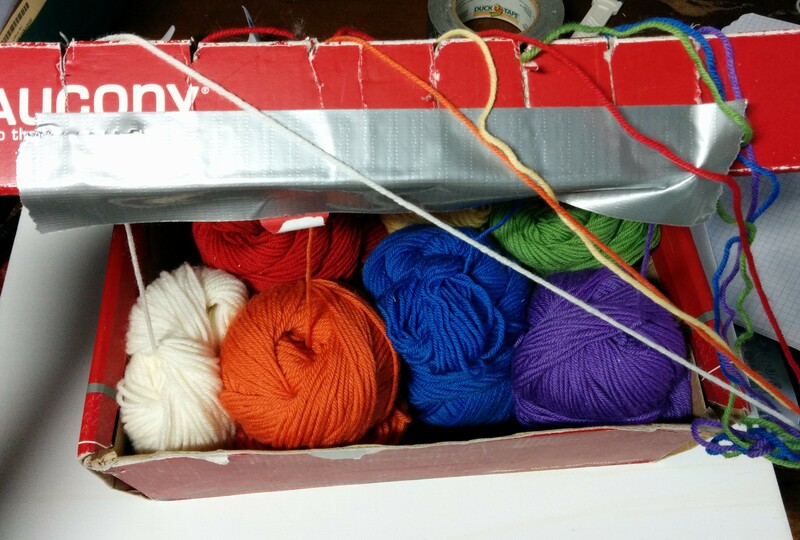 To get the rainbow, I had to carry 7 balls of yarn back and forth. 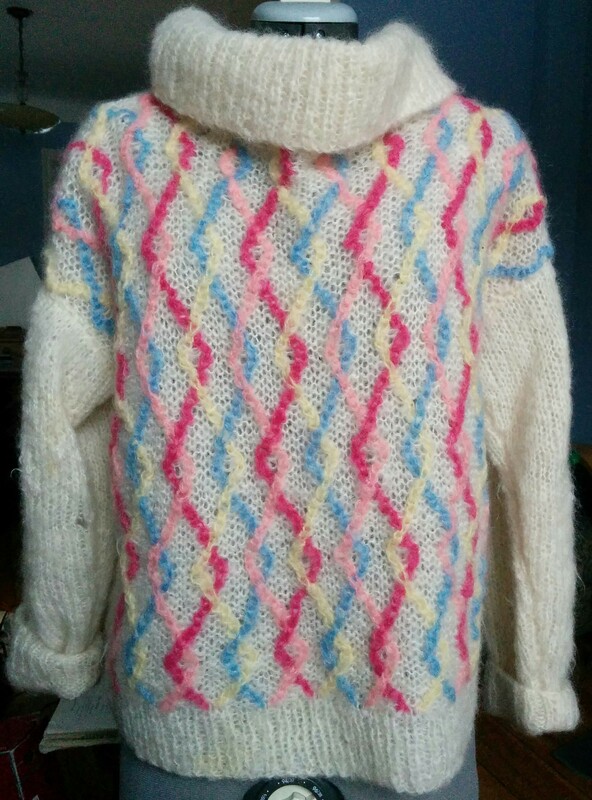 I used a similar method to one I developed for myself about 30 years ago when I made this sweater for my sister in law: I decided then to use a small ball for each of the colour stripes I carried up the front of this mohair sweater, This meant I had 25 strands of yarn working in total. I used to refer to this kind of stuff as my masochistic knitting. I showed some tartan pillows a while back that fell in the same category. I remember I had two slotted pieces of plastic and I put one strand in each slot, then put the other piece of plastic on top so the strands were basically running through one hole each. With care, I could trade the places of two strands of yarn and make sure on the purl side they went back into their old places. If you left this many strands to their own devices, you would spend as much time untangling as knitting. This time I cut the slots from a shoe box, put the balls inside and closed the lid. It worked really well and I only had to stop once to get my strands back in order when I lost concentration. 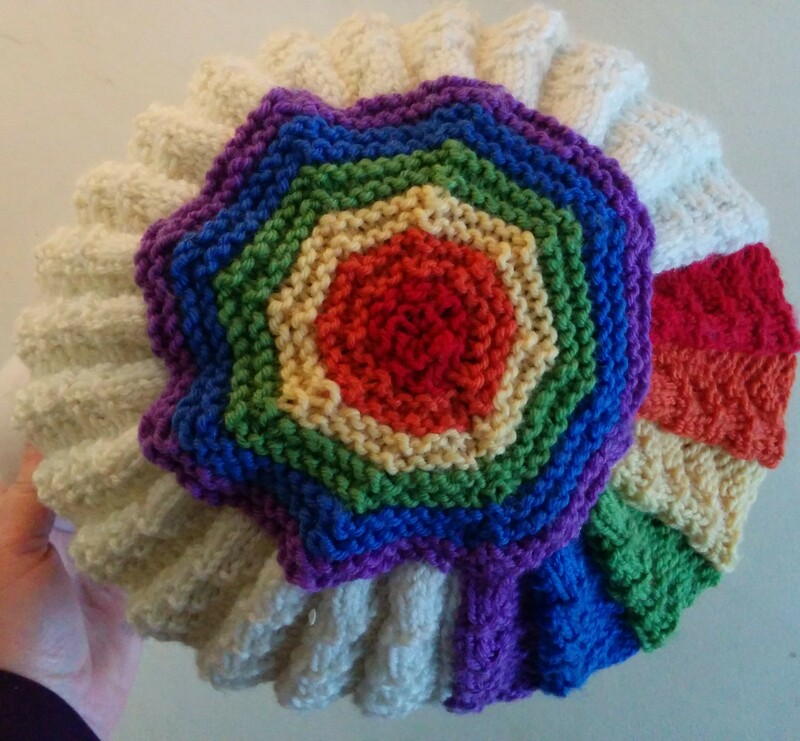 I am not sure what anyone else thinks about this hat, but I was happy that it actually turned out exactly as I had planned. 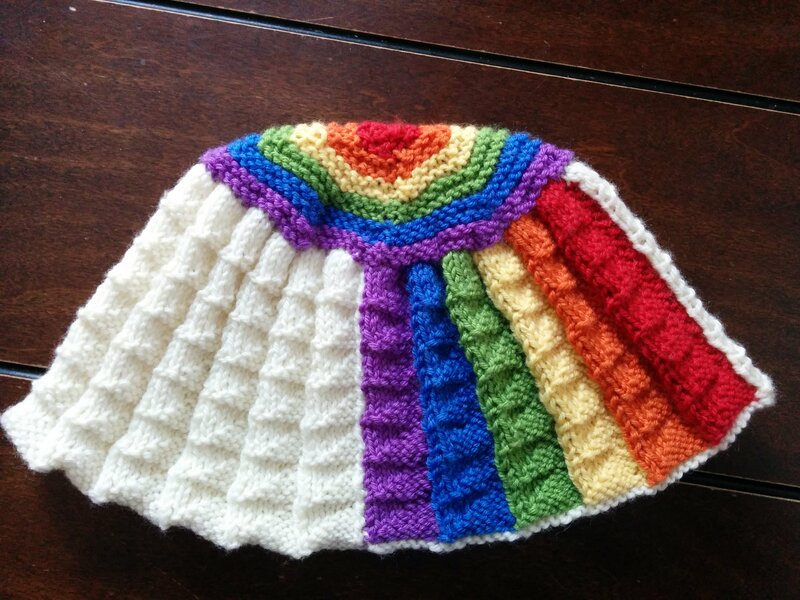 When I had the main part of the hat knit, I picked up 4 stitches from each 7 stitch repeat so I had 100 stitches. I then did garter stitch on the top, 4 rows per colour. I used 8 points of decrease. The first decrease needed to get rid of more stitches so I knit 10, knit 2 together, then knit 10, knit 3 together around. Next time I knit 9, knit 2 together around then knit 8, knit 2 together etc. 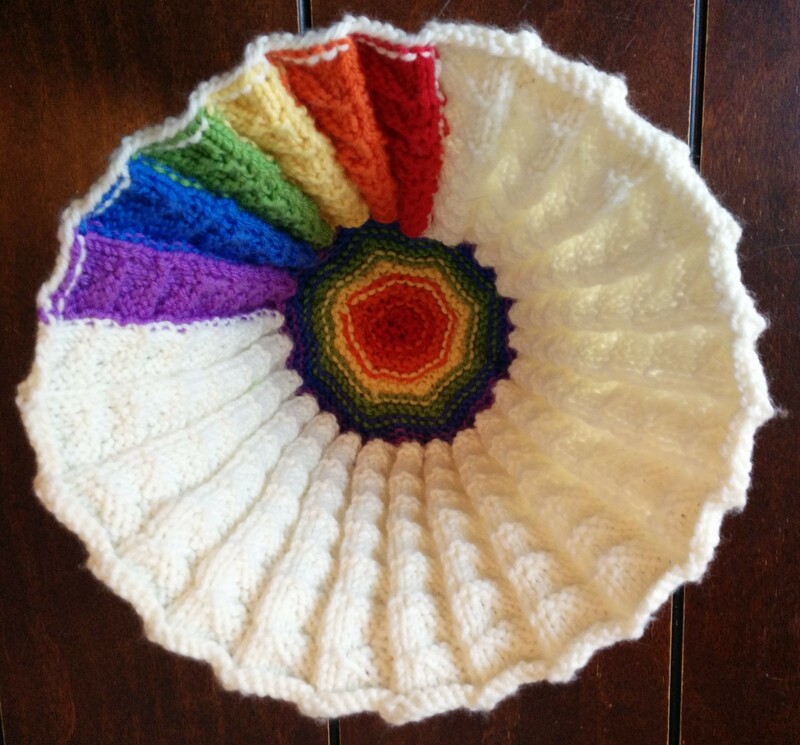 At this point I had what looked like a giant coffee filter with a rainbow on it. I picked up 100 stitches from the opposite edge and did two rows of garter stitch per colour to finish the hat band. 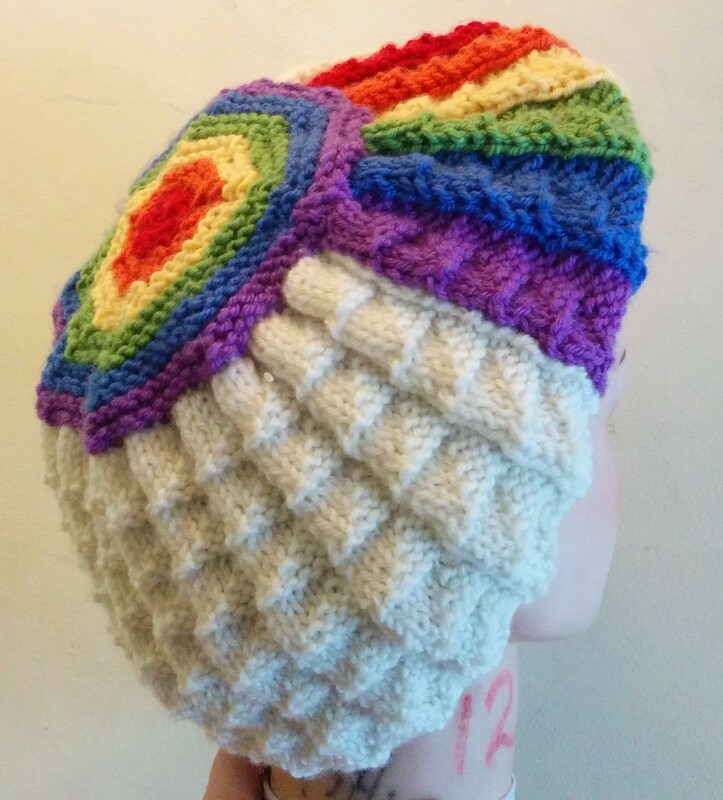 This entry was posted in Barbara Walker and tagged A Treasury of Knitting Patterns, Barbara Walker, Cascade 220, knitted hat on March 9, 2016 by gillianknitter.